With Spring Training drawing near a close, it's time to see what we've learned from the Yankees' Grapefruit League action. We previously highlighted Aaron Judge's torrid spring as well as Troy Tulowitzki's early power. Giancarlo Stanton and Gleyber Torres having strong springs hardly qualifies as a surprise. So here are some of the other standouts from the Yankees' exhibition games from the last month and what those performances mean going into the season. 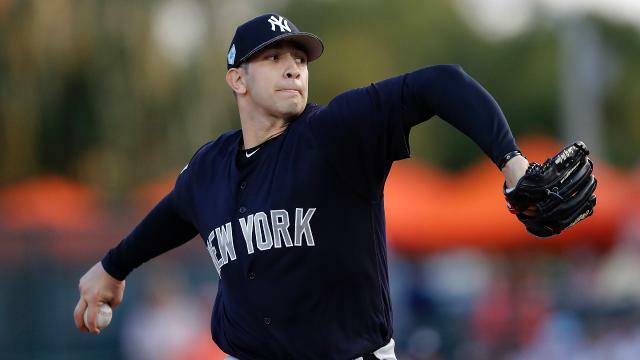 Over the last three seasons, Cessa has been a frequent rider on the shuttle between the Bronx and Triple-A Scranton, accumulating 151 innings in the Majors. His numbers have been fine, sporting a 4.71 ERA with 115 strikeouts in that time. One of his major bugaboos has been frequent home runs, allowing 28, or 1.7 per nine innings. This spring, he's been a force as he competes for the openings in the Yankees' rotation. Cessa has surrendered just one run in 17 innings, walking one and striking out 18. He also sports a 0.588 WHIP and has yet to allow a long ball. With these numbers, the 26-year-old righty earned a spot on the Opening Day roster. It's unclear what his role will be, but he is a frontrunner for the fifth starter role when the Yankees need one in a few weeks. Bird and Voit have made it especially tough on the Yankees' brass as they compete for the starting first base job. Bird has been an on-base machine with 13 hits and 11 walks in 51 plate appearances, batting .333/.490/.641 with three home runs. Meanwhile, Voit has been equal to the task with a .293/.362/.610 line to go with four home runs (and a rare stolen base). Though neither has proven himself for a large chunk of MLB time, they also don't look like they need more Triple-A seasoning. It initially appeared one of them would get sent down after the spring, but Aaron Hicks' injury has created the opportunity for both to make the Opening Day roster. Tarpley made himself known with strong results in a September call-up last year. Ignoring his ugly postseason appearance, he struck out 13 in nine innings while allowing just three runs. He's largely picked up from where he left. The 26-year-old southpaw has used his two-seam sinker to pulverize Grapefruit League competition, allowing no runs and seven baserunners in 11 1/3 innings. As a non-All-Star reliever with options on the 40-man roster, Tarpley will likely be an up-and-down arm in 2019. His stupendous spring makes a spot on the Opening Day roster possible after Dellin Betances' injury threw a wrench into the Yankees' plans. German's 4.11 ERA doesn't tell the whole story of his spring; He's actually been impressive until his most recent outing, a dud against the Cardinals. Five of the seven earned runs and all three of the home runs he's allowed came against St. Louis. Still, the right-hander has a 22:2 strikeout-to-walk ratio in 15 1/3 innings of work. For a pitcher who struggled with command last season, that's a welcome statline. His body of work to go with his pure stuff paved the way for the Yankees to name him their No. 4 starter to begin the season. He may work with an opener, but he'll be the bulk pitcher at the very least. Among players with at least 20 plate appearances for the Yankees this spring, Urshela's 1.145 OPS is third behind Judge and Kyle Higashioka. He has two homers and three doubles as a non-roster invitee. Formerly the starting third baseman for the Indians, Urshela couldn't establish his bat in the Major Leagues and was traded to the Blue Jays last year. The Yankees added him from the Jays, and he sits as solid infield depth in the Minor Leagues. Urshela could surprise fans as a potential addition to the roster if injuries befall the infield this season. He has a base as a top-end defender and now could show a little more offensively. Tyler Wade: The utilityman has shown some pop with seven doubles and a homer to go with three stolen bases and a .907 OPS. Oh yeah, and he has played every position but pitcher, catcher and first base. Tommy Kahnle and Jonathan Holder: A good two-for-one here, but the right-handed relief duo have combined to give up just two earned runs in 18 2/3 innings while striking out 13 batters. Kahnle hasn't issued a walk. Phillip Diehl: Diehl has had a solid March and turned a few heads later in Grapefruit League games. Though he has a 4.50 ERA, the non-roster invitee has struck out 17 batters in 10 innings. Unfortunately for him, it led to him being a trade chip in a deal with Colorado. James Paxton: The new southpaw has faced some steep competition compared to other Yankee pitchers and has responded with a 1.54 ERA and 14 strikeouts in 11 2/3 innings.